Cancer runs in Vanessa Austin’s family. Her mother and brother—to whom Austin dedicates her book—both died from various types of the disease. Her sister survived breast cancer. On June 1, 2009, Austin heard from her biopsy—malignant. Cries In the Wind chronicles her battle with breast cancer, a battle she eventually won with medical attention, family support, and—above all—her Judeo-Christian faith. Austin’s thesis is clear: “The cancer diagnosis stunned me, saddened me, and frightened me. But after I phoned my husband about my diagnosis, I sought the Lord in prayer. The Lord lifted me out of darkness and dreariness that I was feeling.” She quotes Psalm 50:15 as her spiritual balm. Austin quotes a lot of scripture in her book. A whole lot. Through scripture, Austin finds the strength to fight her disease. And what a fight it is. Austin writes that mammograms detected cancer in her left breast in 2007 and 2008. She was not informed. And in 2010 on a trip to physical therapy, she was stopped for a traffic violation that resulted in her arrest after she suffered a physical reaction to her medication. She overcomes these and other indignities through her faith, she writes. A poet, Austin peppers her book with inspirational epigrams and poems. For example, she writes, “Fear will keep you down but faith will pick you up!” Austin further writes, “Cries In the Wind: God’s Answer is derived from ‘My Battle Cry,’ which is a prayer/poem that I wrote two months after my cancer surgery….” The poem opens, “As I fall on my knees, / Father God, I pray, / Help me fight this cancerous disease.” This poem fairly much defines Austin’s story and book. Austin ends her book with helpful hints for those who have recently received a similar medical diagnosis. 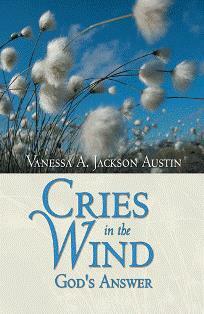 She includes lined pages on which readers may write “Personal Thoughts,” meditations on Austin’s story. True to the nature of the book, the author catalogues a list of “Healing Scriptures.” She also includes testimonials from other cancer survivors and a survival guide that includes an acrostic poem. Austin ends her book with a bibliography of sorts—a list of cancer patient help groups, including their contact information and primary mission. Danny Gamble is communications director for the Alabama Writers’ Forum.